Home / Thoughts / Social innovation is a serious business. Seriously. Social innovation is a serious business. Seriously. Social innovators from around the globe came together to explore how social innovation can have even greater positive social impact in the coming decade. 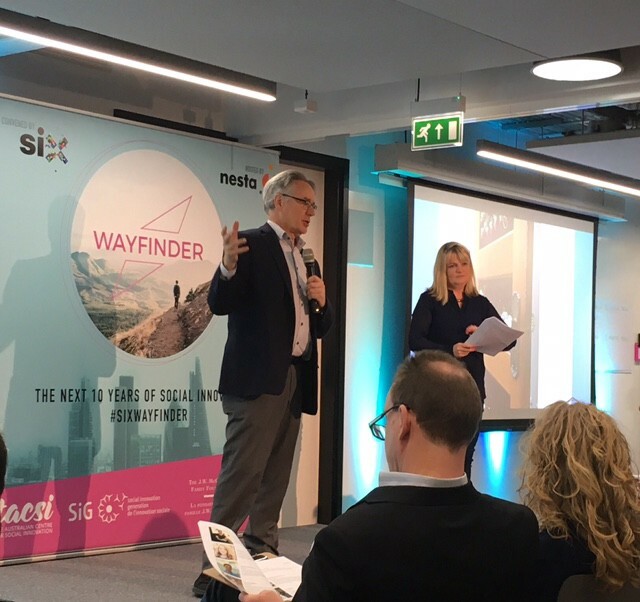 Last week I spent a day with social innovators at SIX’s Wayfinder event. Social innovators from around the globe came together to explore how social innovation can have even greater positive social impact in the coming decade. It was an inspiring group — those leading innovation ‘labs’ from around the world, writers and thinkers from Nigeria to the US, social entrepreneurs from China to India, and people from businesses where the pursuit of social impact is at the heart of their ‘bottom line’. So, what do a room full of serious social innovators talk about? A moving call to action from Tarik Yousef of the Brookings Institution Doha Centre. In amongst a series of quick fire contributions from this group of energetic innovators, his tone was sober and serious. In the Arab world, money and energy are being sucked endlessly into the cause of tackling radicalisation. Social innovators may not have the position or voice to offer an alternative to this dominant narrative of fear, but we should absolutely be challenging ourselves to tackle the huge issues that feed it in new and positive ways — inequality, racism and global migration to name but a few. It’s not enough to have some social impact. There is a moral — and a political — imperative to be sure that we are tackling the deep-seated issues of our time that are creating the space for the politics of fear and exclusion. A reminder of the power of business to drive serious, positive change in the world from Lisen Wiren of Ikea. Using 1% of the world’s cotton supply, if they reform their supply chains to support local economies, it matters. With hundreds of thousands of employees worldwide, if they are supporting them to become social entrepreneurs in their communities, it matters. If they apply their resource and expertise to tackle a major challenge (like safe, warm accommodation in refugee camps) it can be transformative. It is well-trodden ground to suggest that mainstream transformation will occur at the intersection of public, private and ‘third’ sectors — and the scale and ambition of this work made me determined to grow broader partnerships in our own work. A brilliant call to action from Mark Moore of Harvard University to focus on generating demand for change, rather than the supply of more and more great innovations. At the heart of the social innovations that Innovation Unit and others get most excited about, is fundamentally a shift of power. Whether it is patients taking control of their long term conditions and their lives through people powered health, or children and parents helping to shape learning in their schools, or cities creating platforms for local people to come together to identify and solve the problems of their place, these are not simply technical solutions to big problems. They involve a rewiring of how people see themselves, of their agency and confidence to shape their own lives and communities — and, as Mark Moore pointed out, a shift in how we see our own social status and that of others. Through this lens, the work of social innovators is profoundly political. We need to be as concerned about growing movements for this kind of change as we are about the development of products and services that exemplify it — we need to ‘call a public into existence that has it within them to drive the change it wants to see’. Innovation Unit’s mission is to grow new solutions that enable more people to belong and contribute to thriving societies — societies in which inequalities are reduced, all forms of contribution are valued and power is exercised in partnership. So we couldn’t agree more, and how to help bring any of this about remains the killer question for us at Innovation Unit.